Relative measuring instruments which can measure dimensions of various workpices like machine parts by using air flow is called Air Micrometer. It comes in Flow type and Back Pressure type mainly. the nozzle part and the workpiece changes, the amount of air coming out of the nozzle also chenges, causing the height of a float to change. By reading the graduated positions of the float, the actual dimensions of the workpieces can be determined. This is the princible. making it of great value in quality control and increased efficiency in a world-wide industrial world. to measure dimensions, but also for complicated profile measuring automatic measuring, automatic sorting and etc., making them practical over a wide variety of uses. The measuring head can be standardized according to measuring factors and also by order-made designs to meet various measuring requirement. 1. Measured by air blow, an accurate measured value can be obtained with out being affected by oil or dusts. 2. Basically, as a result of non-contact measurement, the workpiece to be measured is not corrupted. 3. With high quality and supperior stability, it is easy to operate. 4. Many kinds of measuring heads are available, for a wide range of measuring purposes. 5. A unique taper tube keeps the float from sticking to the upper area. Furthermore it is easy ti remove and fabricate (column type). 6. Because of "block-built method" (column type), it can easily be set up to measure multiple places. 7. The back pressure type has superior stability of measured value in measurement against change of air pressure. 8. In addition to the basic functions, other automatic measuring functions such as class sorting and data output are installed. Measurement as below can be applied by using various measuring heads. For conicity, form & basic diam. measuring head as read by the expansion of a float in taper tude. tube are standard accessories), measuning head and masters. Two standard magnifications can be shared. Since the upper damper is made of resin, it won't scratch the float. Taper tubes are easy to remove. Magnification standards of all taper tubes are the same. basic units of NO.3100 required and right & left feet. The above picture shows a three colums flowmec with a measuring head and master for taper degree measurement. 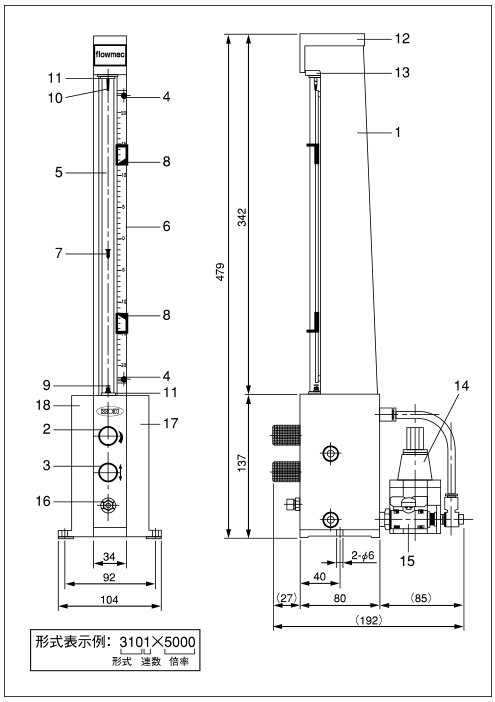 Indication of number of columns and magnitication is required when placing an order. Note: Please contact us if you would like to change the number of colums adter purchasing this Product. Note: The upper damper is exclusively for the specifications of the standard x 1000 magnification. Compact type pursuing user’s measurement intentions and needs. Each size of W67mm x H107mm(124mm for DI-40)x115mm. within a range of 85 to 264V for multiple area usage. Select each model dependent on intended usage. Previously the air pressure of flow type air circuits was limited due to the use of tapered glass tubes. Now through the use of a backpressure type circuit, higher reliability of the measuring. head and furthermore, eliminating oil or dust of measuring workpices. pressure type air circuit, it is less influenced by pressure fluctuations in air supply, which can result in higher sensitivity and a wider range of measurement. Adjusting knobs is applied for easy operation. Each measured value is indicated in three colors of green (OK), red(+NG), yellow (-NG), thus decision output reading is also superior (DI-21). Analog display can help to read MAC/MIN value and position in the tolerance easily. Mist separator and base unit are option. thus workshop load reduced by easy read. pressure type which has almost no influence by change of air source supplied. 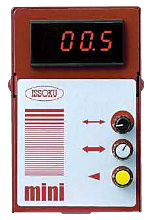 Big scale board with analog indicator is easy to read and makes worker's tired feeling reduce. This instrument applies differential pressure type. This method gives stable measurement because it has almost no influence by change of air pressure supplied accordingly. thus more wide measuring clearance gives high durability of measuring head. 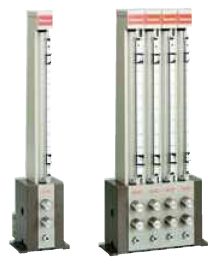 Polarity inversion for internal or external measurement is easy to operate by switching oone lever. Easy to operate set-up of maginification adjustment and zero adjustment because each nob is independent. Full magnification series can meet your mesuring requirement. Extra-small diam. nozzle like 0.3 nozzle is one of environment cinscious products to realize energy saving. *As to "differential pressure type", please refer to catalog of Digital Model Airmicrometer "mni". The Column Model(bar graph type) Air Micrometer and Electronic Micrometer ”COLMEC” is easy to use in production areas or inspection rooms. Two specifications, the Air Micrometer and Electronic Micrometer, make various measurement possible. In addition to the dimensions, profile, position, and runout of the workpiece can be measured by multi-column combination can be quickly and accurately. so data can be transmitted to a computer or parameters set-up can be operated via a computer, thorugh the interface. enabling them to handle many factory automation requirements such as automatic measurements. A1 is air micrometer (back pressure type) with high accuracy and multiple function. This type is suitable to regular measurementsof internal/external diam., thickness,etc. of difference of 2 places, such as taper degree, difference in incline, parallelism,etc. Measuring range is changed easily by changing installed pilot jet. E1 is 1CH Electronic micrometer. E2 is 2CH Electromic micrometer which can be connected with two sensors. It is possible to do vatious measurements by method of electrocal computing. There is no switching of the measuring range. (LVDT) is adaptable to all sensors made by other companies. can be configured via the operating keys. via the three-color LED bar graph. while the A2 comes standard with thirty-five basic operational modes. touch of the operating keys. ranking assessments to be output and control signals to be input. (operating mode or value of measurements). capturemeasurements in addition to regular measurements.